For those who don't know our story, I'll give a short description here. I am not one of those people who has owned a Land-Rover for 20 years. I did not buy mine new from the dealer and I only have one. I was sucked into the Rover thing by hanging around with other British car folks. At British car shows, I would stop to look at the big square Land-Rovers. As a car nut, I knew what they were, but I really didn't know what they were, you know what I mean? So, after a few car shows at Stanford (technically, the Palo Alto All British Field Meet) I thought that it would be really neat to have a Land-Rover. 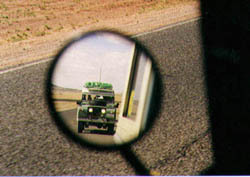 A few years back I had a Jeep and I thought that the Land-Rover was an older, British jeep. Well, since I had already bought one British car, I knew the drill. Read books; join a club; talk to owners of vehicles. I even bought a prospective owners kit from the British Northwest Land Rover company (hey, I'm bareing my soul here!). I loitered around Land-Rovers, talking to a couple owners in Davis who had non-running Rovers parked in their frontyards. I thought things were going OK. I even made up my mind and thought that a series 2a 5 door station wagon was what I wanted. Then a local friend gave me a copy of a page from Hemmings. On the page was an ad from the East Coast Rover Company. They sounded like they did it all- repair, restore and import but I had never heard of them. So, I called and talked to Mike Smith. We talked and eventually I bought a Dormobile he had imported from England. We call it Elvis. The following photos and text describe our trips with Elvis. None are truly remarkable trips to the Yukon or Central America but they have been adventures for us. The drive home with Elvis, from Maine to California was originally published in the Rovers North Newsletter. Jeff Aronson did a very good job editing my writing, so the following version is not the same as he published. In addition, I have included more pictures for your viewing pleasure. Copyright Dixon Kenner, 1995-2008. Last modified July 23, 2008.